We were all shocked and unimaginably saddened to learn last month that Tom Shinness had passed away on February 17, 2017 after a short battle with cancer. Friends and fans have been publicly grieving and sharing videos and thoughts on Facebook, and the family held a “Celebration of Life” service with memories and music on the 25th. I’m glad that Chuck Thompson was able to represent the Harp Guitar Gathering, performing our traditional finale piece “The Water is Wide” with Phil Keaggy. There are many other highlights – photos, videos and stories – shared in the video as well. I’ve been processing the news for a couple weeks now, listening to his CDs, watching videos and going through my photo archives. Here are a few memories that I’d like to share about my own moments with Tom. If you are so moved, please add your own memories in the comments section below, knowing that this tribute will remain live (archived) for decades to come. I don’t remember seeing Tom before he took the stage for his Saturday morning segment. He plugged in, gave a couple test strums, said hello and then…performed. I noticed that most photos show him playing in eyes-closed musical reverie. But some of the videos I recently watched captured that penetrating stare he would give each individual as he connected to his audience with unfiltered soul-baring confidence. That’s what I now recall was my first take away from his set that morning in 2004. Rather quiet offstage, he was a rock star on. My impression after that first hour of Tom was a cross between Jimi Hendrix and Harpo Marx. And no, I don’t mean the curly strawberry hair. I vividly recall later sitting privately with a girlfriend he had brought along and sharing with her my observation that he had this natural magnetism – the same thing said of Harpo, whom children and dogs would instinctively seek out. His Gibson harp guitar sounded glorious through his pickups and amp, with what he called his “magic reverb” – whatever that may have been. Remember “Echo Song”? A simple piece composed with an echo delay on the quarter note. His “improvised” lines would form colors and phrases that were part effect, part composition. A simple eighth note scale on a key change created a mesmerizing motif as the notes cascaded over themselves in lovely harmonies. You can find this at the end of his Many Waters CD. Tom had driven up with a bunch of his instruments as well. Several of us were hanging around in a hotel room that night (or the next) and Tom walked in with his mando-cello, which he had created out of a smallish, old Alvarez/Yairi 12-string guitar. He said he wanted Stephen to hear a special tune, and proceeded to launch – in full concert performance mode – into “Mando Tap,” with me sitting on the floor right in front of him. That snare hit he did with a finger on the body edge sounded like a shotgun, and the whole piece was a tour de force in musical tapping/rapping/slapping. The key being musical. This video gives a good repetition of it (click image – and note that finger stretch on heavy double courses!). He later handed it to me to try and it was all but unplayable – high, heavy action that probably only his fingers were capable of pulling sound out of (his Gibson HG wasn’t any easier). “Mando Tap” appears on Tom’s Something Inseparable CD. Remember my harp mandolin solo extravaganza “The Friends I Finally Met”? That was my homage to the players of Harp Guitar Gathering 2, and certainly half of its inspiration was Tom alone – with that hotel room performance fresh in my mind. What in the world? We knew he wasn’t going to travel to John Doan’s Salem, Oregon Gathering with his Gibson and didn’t expect to see him that year. But he surprised us with something he whipped up just for the event. A cheap double-neck electric guitar with the top neck converted to sub-basses, and then a small bolted-on fretless zither for super-trebles. He succeeded in out-Doaning Doan! With this creation he was thus in a more improvisational mode throughout the weekend. At HGG5 we were back again in Williamsburg with Stephen hosting and again featured Tom. 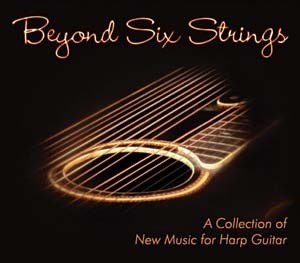 By this time (2007), Stephen Bennett, John Doan and I had co-produced the groundbreaking harp guitar compilation Beyond Six Strings. We voted to open the CD with Tom’s Translucent Harp CD tune “Don’t Give into Sorrow about Tomorrow,” which was then, and remains, one of the coolest HG tunes ever. In 2006, I re-licensed the BSS compilation from the gang to start record label and web store Harp Guitar Music. It’s still collecting royalties into the foreseeable future, and Tom’s opening track remains the biggest seller (outside of Andy McKee’s track, post-YouTube phenom). This and funds from the last of his consignment CDs he left with me will be routed to his daughters from here on. 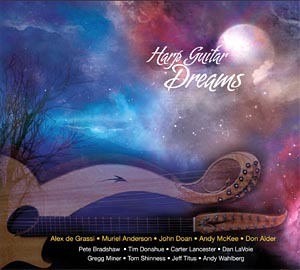 In 2008, I released the second HGM compilation Harp Guitar Dreams, this time with the majority of tunes being written by the artists specifically for this “concept album.” However, communicating my intended concept to the participants proved trickier than I thought (“Think New Age,’ but not lame” being one of my more articulate instructions…Stephen Bennett actually had to bow out because as he explained, his music “literally reeks of melody.”). Tom gamely sent in a series of quick themes and, while it was of course a thrill to be privy to his private creative process and demo recordings, he wasn’t quite getting it either. Mentioning that a tune like “Dulcitar” (from his Translucent Harp CD, which he referred to as “my Sgt Peppers”) was perfect for what I was envisioning, he mentioned that he had in fact played around with that on harp guitar from time to time (it was originally an ensemble piece centered around the dulcitar). And so, “Dulcitar Dreams” was born, our first professional collaboration! Tom was thrilled to share his music, and also a fan of others’. Of my Dreams piece on the Knutsen “zither-harp-guitar,” he said “I am absolutely blown away by your piece. Those are the kind of sounds I want to make. I used to perform surrounded by 2-3 zithers on a keyboard stand, and play them and the guitar at the same time. Sometimes I would gaffer-tape zithers to the tops of my guitars and acoustic bass guitar. I wish I would have persisted with it. It was a lot of maintenance at gigs!” I was similarly blown away by his praise, but also in envisioning his creative efforts to produce it live on stage. 2010 saw Tom back at the Harp Guitar Gathering 8 in Indiana, hosted by Brad Hoyt. Above, he performs his incredible rendition of Hendrix’ “Little Wing”. 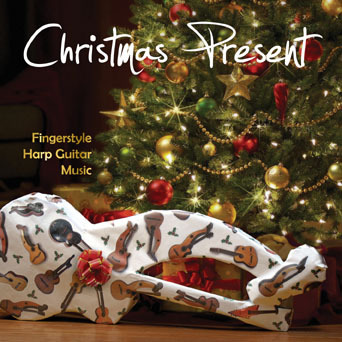 But that was only one track of four duets on this album of all-new harp guitar material. I had this really strange arrangement from a 2000-ish unfinished project of “My Favorite Things” from Sound of Music. Being lazy and knowing that a lot of artists have thrown it on their Holiday albums solely on the basis of a few “wintery” lyrics, I chose to submit this one (yes, to myself, but also assistant Frank Doucette). My old demo arrangement consisted of my Dyer harp guitar with a sampled upright bass – both plucked and arco – playing melody and counterpoint bass notes to the Dyer’s sub-bass notes. I was planning on booking a pro L.A. studio bassist for the recording when I remembered, Hey! Tom was a professional bassist – and a harp guitarist, friend, and on the album himself. Yes, it was a Homer Simpson D’oh! moment just in time. Quick Sidebar: Speaking of which, remember when I turned a bunch of us into Simpsons characters for my HGG5 Anniversary presentation? People said afterwards that Tom was in the back of the audience seats just killing himself. No one had ever seen him in such hysterics. I love that story, and just wish I would’ve spotted him during. Back to my tune – so I sent Tom the demo and score, he again raved about the arrangement, then shortly sent me a rough cut and a final. Bravo! His tight playing helped make my challenging “bass on bass” arrangement work. I’m sure anyone who has had the pleasure of having Tom play in their show or on their record feels as honored as I was. Keyboardist/harp guitarist Brad Hoyt was another Shinness fan and asked Tom to play cello on his second harp guitar album Far Away From Everyday. At the 10th Harp Guitar Gathering in Texas – sadly the last Gathering Tom made it to – he drove down with his Gibson and cello and made his presence felt throughout the weekend – on stage for his final solo set for us, and improvising with Hiro and others on cello. In these moments it seemed as if he had been playing with these impromptu partners all his life, as they were so in tune with each other. It didn’t matter if it was a Beatles tune he knew backwards and forwards or something Hiro just sprung on him. He was instantaneously and constantly only in the pure musical moment. I think we were all thrilled for Tom when he got his touring gig with Keb’ Mo’ in 2014. Not only did he make some good money, good music and national exposure, but he got to bring his harp guitar! He shared some of that story with us in my blog Harp Guitar Blues. Unbelievably, he was right down the street from me (15 minutes down the freeway staying at the Sportsman Lodge) when Keb’ and Co. did the Tonight Show or one of those. I invited him and the whole gang over, but Tom couldn’t break away. They later played a couple hours away, and I couldn’t make the show. He so wanted to come visit but we couldn’t make it happen that trip. Alas, this was to my everlasting regret. Can you imagine Tom Shinness in the Miner Museum?! He would’ve never been able to leave, he probably would have simply moved in…and I don’t think I would have let him out without first recording an album with a hundred or so different instruments. “You somehow play each note as if it were the most important note in the world…” This – or something like it – is what I said to him after experiencing him at HGG2. I’ve never thought that about any of my guitar heroes, before or since. And clearly I wasn’t the first or only fan to come up with this exact observation (he later alluded to this in our last private conversation – apparently a lot of fans shared these exact same and similar words to him throughout his career). No matter where or for whom, when he played anything, he played with all his heart and pure love of the music and sharing it with an audience. He may have played it a thousand (and probably more) times, but it seemed as if one was witnessing a tune’s first and last performance; this was it, this was the performance. Thank you, Tom, for performing for us. Brilliant Blog Gregg. I only knew Tom through his cds, and we talked together a few times on Facebook(for talked read typed) when he went into hospital, and I was headed there myself. We were giving each other encouragement and positive vibes, and I told him we would get through it and be playing together when we were both better. His answer to me was “Right on man!”. He seemed to be a very positive person. His passing affected me quite bit, even though I didn’t know him well at all, as I survived to play another day. I’m so sad that he didn’t make it after trying so hard, and his passing leaves not just the Harp guitar world, but the world in general a sadder place. Vale Tom Shinness, a truly great musician. Great job – again – Gregg! Thank your for putting that all together. I was sad to learn of his health problems and hoped he’d come out on top of them. It was a shock to learn that he hadn’t. Tom was one of the finest musicians I’ve ever crossed paths with. I first met him in Nashville at the Chet Atkins Appreciation Society Convention back in 1997 and heard him there quite a few years subsequently. I’d never heard a Gibson harp guitar sound good before. Period. Tom absolutely made magic on the thing. As you noted, Gregg, it seemed as though each note he played was the most important. A rare quality indeed. After the first Harp Guitar Gathering happened in 2003 and all of us assembled that year decided we wanted to do it again, I knew Tom needed to be at the next one. It tickled me completely to introduce him to everyone that year, as well as to discover that he was an even better musician than I’d realized in Nashville. My other favorite memory of Tom is that performance of Little Wing he did at HGG10 that you mentioned. I told him afterwards it was the very best version of the tune I’d ever heard, bar none. Absolutely brilliant. I was delighted when he made the connection with Keb Mo and got all that great exposure. It was richly deserved. Rest in peace, Tom. You’ll be missed. I wanted so badly to go to Tom’s memorial service, but could not break free from my obligations. Thanks so much for posting a link to the video of the service! Chuck did a great job representing the harp guitar community for us, and I never knew that Tom was responsible for talking Phil Keaggy into doing the 30th anniversary Master and the Musician tour. Though I never had the honor of meeting Tom personally, he kindly reached out to me as a fellow Gibson player, and we had several online conversations about building and restoring our various instruments. He is greatly missed, but he has left us a wonderful musical legacy. Thank you, Gregg! A wonderful tribute to an amazing guitarist who’s eyes always seemed to be smiling. Our second HGG was #8, in Indianapolis. It was also the scene of our first legendary late-night Harp Jam. As seen on the HGG blog section, the group just snowballed, comprised of folks who are now dear family to us. Our friend Judy took some great pics of the fun and some of the most thrilling (and now bittersweet) ones are the shots we saved of Tom jumping in with his cello. The joy on his face and the genius of his musicianship stay with us. We carry such pictures and the amazing sounds he got from that old U-harp in our memories and in our hearts. There’s been a death in The Family and we grieve for what we lose while we rejoice in what we had. We will never hear “To Make You Feel My Love” without remembering how he owned that song, as he owned everything musical he touched.